Handmade and cruelty-free, in a variety of stunning styles to enhance your eyes. 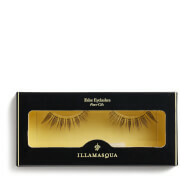 Apply Lush Lashes with the latex-free glue provided, and combine with Illamasqua eye colours for eyes that hypnotise. Measure the lash strip against the eye and trim from the outer end if necessary. Apply the glue provided to the lash strip and wait for the glue to be tacky before placing closely above the natural lashes. Press gently. 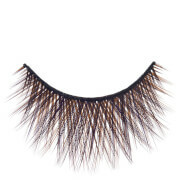 Apply an additional pair of lashes for a statement look. Acrylates/Ethylhexyl Acrylate Copolymer, Aqua (Water, Eau ).Stop use if Irritation Occurs. The eyelashes are amazing, really easy to apply and look great with any make up look. Great quality product! My favorite lashes! Bought my first set of Lush lashes in the sale months ago and now I'm hooked! Always last me around 25-30 wears out of them!! As a makeup artist I've used my fair share but I'll never look back! I absolutely love these, I receive a lot of compliments for them. Honestly the best eyelashes, so thick and long. Adds such an impact to any kind of eye look. Got them in the sale but I'd definitely pay full price. The glue is also very good, just wish I could purchase more separately. I love dramatic lashes, and these are definitely that. A little trickier to apply than some because the lash band is so thick, but it's not a big deal. I also had to cut quite a chunk off the length, so great if you've got larger eyes! And please sell the glue separately! It's probably the best one I've used. 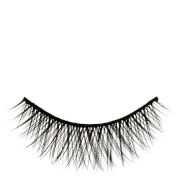 I love the feel of these lashes very dramatic and full so I would only wear on a glam night out.